Frank Lloyd Wright, S.C. Johnson & Son, Inc Administration Building, Racine, Wisconsin, 1936-39. Farrell Grehan/Arcaid Images. In the interest of immersing myself in the Frank Lloyd Wright: Organic Architecture for the 21st Century exhibition (and fulfilling my goal of becoming a tourist in my home state), I have been visiting Wright-designed buildings in Wisconsin over the past few months. First I went to nearby Racine to tour Wright’s 1939 “Wingspread” House built for Herbert Fisk Johnson, Jr. and the 1936 administration building for the S. C. Johnson Company. The Museum’s Chief Curator Brady Roberts pointed out to us on an exhibition tour that Santiago Calatrava visited the Johnson administration building seeking local inspiration when designing the Milwaukee Art Museum expansion—you can see a similar effect of the Johnson building’s cathedral-like glass ceiling interpreted in Windhover Hall. I think that the building model on view in the Museum exhibition beautifully captures the effect of the sky-lighting in the “great workroom” at the Johnson Administration Building. Of course, it was great to be able to verify this personally. 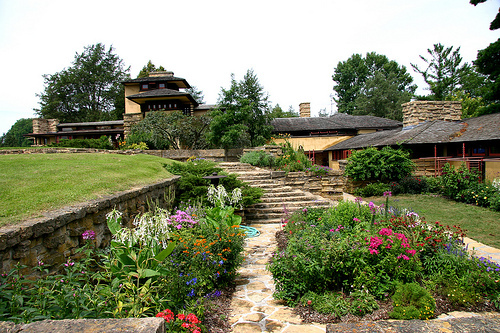 Last fall, I spent an afternoon at Wright’s famous Wisconsin home, Taliesin, in Spring Green. I can easily understand why Wright would choose that location over any other in the country, aside from (or in spite of) proximity to his extended family. The leafy rolling hills, the peaceful waters, the great open skies—the verdant valley is a Midwestern paradise! The first moment I became convinced of Wright’s genius, I was sitting on the sofa at Taliesin, gazing over the Wisconsin panorama, beautifully framed by the windows, which were at the perfect height for soaking up the landscape while seated cozily. The architecture, the furniture, the view and myself were all in perfect harmony with one another. The multi-media aspect of the exhibition really draws upon that truth—being in a Wright-designed building is something to be experienced first hand. 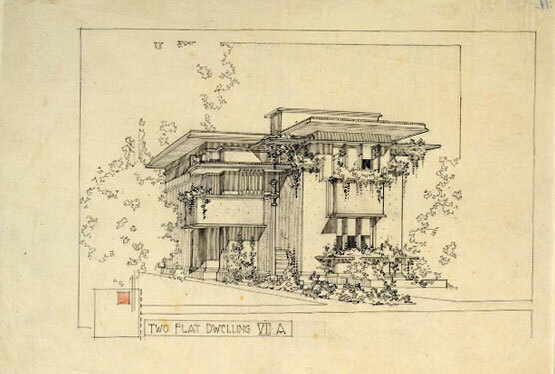 Frank Lloyd Wright, American System Built Houses, Model VII-A, 1915, (For the Richards Company, Milwaukee), View, © 2010 Frank Lloyd Wright Foundation, Scottsdale, AZ. Most recently, I visited the American System Built Homes on Burnham Street, right here in Milwaukee. The Model B-1 home at 2714 W. Burnham Street has been beautifully restored, thanks in part to a Save America’s Treasures Grant. The Burnham Street properties perfect illustration of the exhibition’s focus on Wright’s contemporary relevance: the “System” involved cutting the lumber and other materials off-site, thereby saving material waste (hello, Green Architecture!) and the cost of skilled on-site labor (hello, Recession!). The homes are early examples of modern “pre-fab” homes, but fitted more naturally to their landscape. The feature that was most compelling to me was the window treatments: there are windows nearly all the way around the home, including absolutely charming corner windows, but they are shorter and higher up, so the light comes in but privacy on an urban street is maintained. For the duration of the Frank Lloyd Wright exhibition at the Museum, Wright’s American System Built Model B-1 on 27th and Burnham Street is open for tours every Saturday, with extended hours on June 11, 2011 for the Wright in Wisconsin group’s “Wright and Like Tour” held in Milwaukee. With such an extraordinary opportunity to bring an Art Museum exhibition into my life, where do you think I should visit next? Donele Pettit organizes events, promotions and communications specific to the Milwaukee Art Museum Store and loves to introduce art and design objects for visitors to take home and enjoy in their daily lives. This entry was posted in Art, Exhibitions and tagged architecture, Frank Lloyd Wright, Milwaukee Art Museum, wisconsin. Bookmark the permalink. Hey Donele, I really love this post! I completely agree with you about Wingspread–every time I’m there, there’s just this sense of calm. Pretty amazing. I haven’t been to the Milwaukee buildings yet, but this post reminds me to put that on my to-do list. I hope visitors who come to the exhibition are as inspired as you are to go look at the buildings in person!